This extremely mobile yet beefy tripod jack stand stabilises up to 2 tons (1.8-mt.) worth of vehicle, making it ideal for servicing heavy-duty vehicle transmissions, exhausts and engines that are raised on a two-post hoist or four-post hoist. 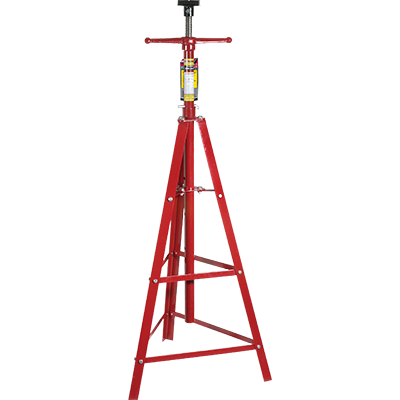 The RJS-2TH 2 ton (1.8-mt) High Tripod Jack Stand is the ideal selection for stabilising a lifted vehicle. The extended ACME screw adjusts to heights between 1,397 mm and 2,210 mm, while heavy-duty rubber stabilisation pads keep everything stationary and scratch-free. Without the proper tools, transmission and engine service can be difficult. In fact, removing heavy equipment from vehicles can shift the centre of gravity significantly, making it nearly impossible to rely on hoist points alone to provide a stable hoist for your vehicle. Luckily, Ranger’s RJS-2TH high tripod stand services virtually every vehicle that can be lifted on a car hoist. Capable of hoisting up to 1,814 kg, that extra support is crucial to keeping the right centre of balance of your lifted vehicle. The tripod design is an architectural classic for a reason: it’s efficient, powerful and almost impossible to knock over. Most non-speciality shops won’t touch these sorts of jobs, so a small device like this can make a huge difference in your bottom line. If you do run a speciality/transmission shop, make sure you’re servicing your vehicles with the best quality jack stands money can buy.